Sheila Pepe is known for her woven and crocheted installations and web-like constructions. Carrie Moyer, for her acrylic paintings with organic shapes and spindly offshoots that end in distorted figurative references that recall Dada and Surrealism. The two artists are partners and sometimes collaborators and both are esteemed educators. For Surviving Sandy their works were installed side-by-side. 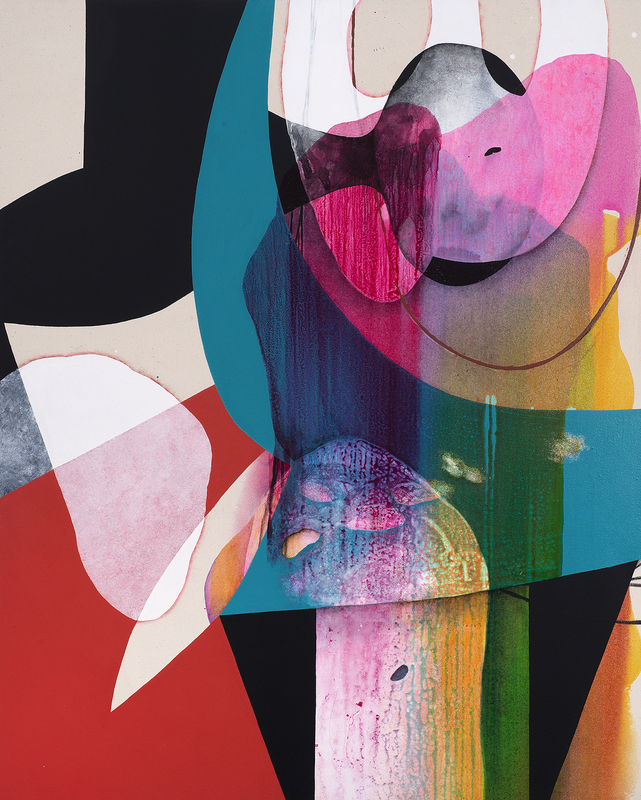 Carrie Moyer, “Carnivalesque,” 2012. Acrylic, glitter, graphite on canvas, 60 x 48″. Courtesy of the artist and CANADA Gallery. Carrie Moyer is deeply committed to the material effects of acrylic paint. She begins each of her paintings by covering the canvas with large, sensual pours. Every part of these poured forms is then modified, touched, and imbued with innumerable local differences—sections are modeled and burnished with variegated tones, hard-edge shapes and opaque paint are pitted against transparent veiled glazes, and areas are pinkened and tinted with acrid colors that lend the forms an unsettling and uncanny bodily-ness. It’s as if all of Moyer’s paintings exist in an accordion reality where things fold in and out of each other from two dimensions to three and back again. Moyer’s paintings leave pores and openings; layers that are covered over retain their identity in tandem with this peek-a-boo tromp l’oeil sense of shallow relief and materiality. These contortions leave the organic forms contained and bound. In Carnivalesque (2012), two white forms merge at the intersection so that a shadow begins to model the flat surface into a round shape, like a bone. A series of glazes also runs through this crossing, leaving the larger form veiled but visible—dripped through a turquoise glaze crusted with jewel-like, pink splatter. The tough knotted chords, woven yarns, and stitched shoelaces overwhelm the actual space in the same way that the flooding pours of colored acrylic overtake Moyer’s canvases. Made of crocheted shoelaces of varying widths in a handsome painterly palette of adjacent blues, greens, and blacks, Pepe’s Corner Piece Redux 2 (2012) is a floor-to-ceiling wall-bound piece that shares an approach to form that parallels Moyer’s. The tough knotted chords, woven yarns, and stitched shoelaces overwhelm the actual space in the same way that the flooding pours of colored acrylic overtake Moyer’s canvases. The crocheted mass is tacked to the wall like a pelt and the weight of the material causes different panels to droop and sag slightly. Emerging from the larger mass, is a weighty black tail-like curlicue that stretches to the floor and coils around a red woven center. Other ends are finished in similar tendril-like offshoots knitted with hairy black yarn. Shelia Pepe, “Corner Piece Redux 2,” (2012). Courtesy of the artist and Carroll and Sons. Photo by Brian Buckley. The warp and weave pucker and flatten in specific ways relative to the width of the chord resulting in a different vertical and horizontal spacing between stitches and an alternating sense of rhythm and pattern even in passages of solid color. A section of turquoise blue bears stitches whose larger gauge reveal the wall behind, whereas closed green stitches in a section beside are packed close and bunch together like foliage. At the raised seams where the two colors are twisted together, the structure of the crocheted stitch is underlined. Pepe highlights by interspersing linear stitches of contrasting color. Likewise this work was exhibited alongside a series of Pepe’s small assemblage sculptures that accentuate the joining of unassuming materials; toilet paper roll, metal bracket, wire, wooden posts, and paper tape are still partly visible. The line, the stitch, and the knot function as drawing gestures in three-dimensional space, but Pepe’s work also frequently incorporates a social dimension. Pepe was taught to crochet by her mother and the intensely labored constructions honor the multigenerational legacy of this feminine handicraft. She also recognizes that crocheting in a group opens space for conversation, sharing, and community. 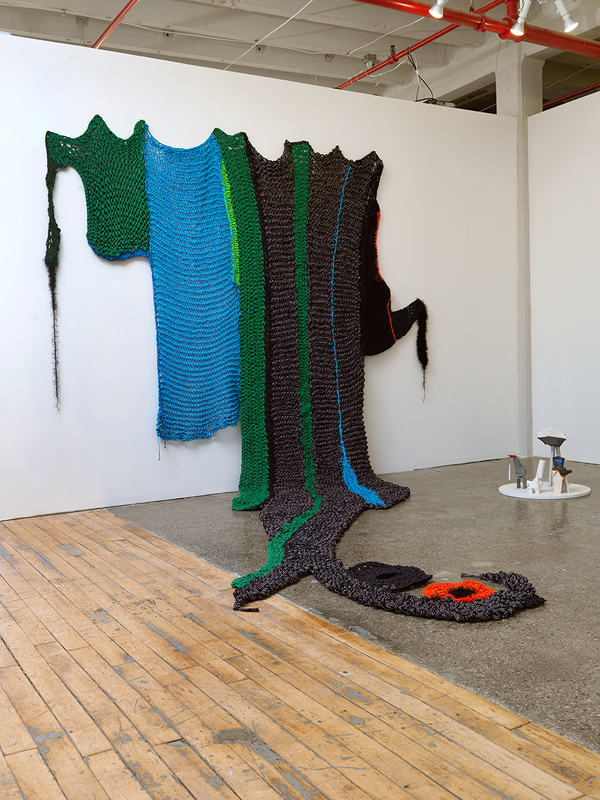 In past works the construction of a crocheted piece becomes a community experience—an open-invitation to a knitting bee is announced and the work is then improvisationally and collaboratively constructed.